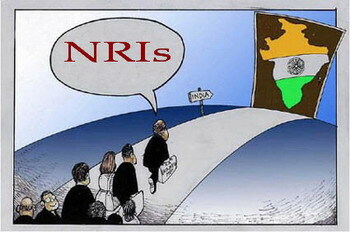 Non-resident Indians (NRIs) are permitted to buy and sell property in India. The acquisition and transfer of immovable property by NRIs should be in accordance with the Foreign Exchange Management Act (FEMA). The property should be purchased through a registered conveyance deed. In case the property is purchased on the basis of a Power of Attorney, an agreement to sell and the Power of Attorney should be executed by the seller in favour of the buyer. However, they are not formally registered with the office of the registrar. As such, no stamp duty is to be paid for the purchase. The Reserve Bank of India (RBI) has granted permission to foreign citizens of Indian origin, whether resident in India or abroad, to purchase property in India for residential or commercial purposes. The purchase consideration should be met either out of inward remittances in foreign exchange through normal banking channels or out of funds from NRE/FCNR accounts maintained with a bank in India. Foreign citizens of Indian origin, purchasing residential property in India under the general permission are required to file a declaration with the central office of the RBI at Mumbai within a period of 90 days from the date of purchase of the property or final payment of purchase consideration along with a certified copy of the document evidencing the transaction and bank certificate regarding the consideration paid. The RBI has granted general permission for such a sale. However, where the property is purchased by another foreign citizen of Indian origin, funds towards the purchase consideration should either be remitted to India or paid out of a NRE/FCNR account. The RBI has granted general permission to let out a property in India. The rental income is eligible for repatriation. The RBI has also granted general permission to certain financial institutions providing housing finance and authorised dealers to grant housing loans to NRIs for acquisition of a house for self-occupation subject to certain conditions. The purpose of the loan, margin money and the quantum of loan will be at par with those applicable to housing loans for residents. Repayment of the loan should be made within a period not exceeding 15 years out of inward remittances or out of funds held in a NRE, FCNR or NRO account. In addition to these, properties other than agricultural land, farm houses, an plantations can be acquired by foreign citizens of Indian origin provided the purchase consideration is met either out of inward remittances in foreign exchange through normal banking channels or out of funds in a NRE or FCNR account maintained with a bank in India. A declaration is to be submitted to the central office of the RBI within a period of 90 days from the date of purchase of the property or final payment of purchase consideration. They can also dispose off such properties. The RBI has also granted general permission to foreign citizens of Indian origin to acquire or dispose off properties - up to two houses - as gift from or to a relative who may be an Indian citizen or a person of Indian origin whether resident in India or not, subject to compliance with applicable tax laws. The RBI also permits non-resident persons (foreign citizens) of Indian origin to transfer as gift property held by them in India to relatives and charitable organisations subject to the condition that the provisions of any other law, including the Foreign Contribution (Regulation) Act 1976 are complied with.